I justified my silent stillness by creating recipes in my mind. Savory Egg Stuffed Poblano Peppers nestled on a bed of enchilada sauced white beans. I did not take the dogs out. This dish was everything I hoped it would be. It is savory and comfortable. A little smoky yet fresh with avocado, fine diced red onion and cilantro. And then there are baked eggs with yolks so creamy. We enjoyed it for brunch. Savory Egg Stuffed Poblano Peppers would make an equally wonderful protein packed vegetarian meal. The ‘bed’ for this recipe is simple. White beans, such as Great Northern or Cannellini, combined with mild diced green chiles and a cup of Homemade Enchilada Sauce. For the flame roasted poblano stuffing I sautéed corn, white onion, red onion, and jalapeno until tender, then stirred in cilantro, cream cheese and pepperjack cheese. Lay the peppers across your gas-stove burners, gas grill or under the broiler set on high. Turn them with metal tongs until all sides are nice and black as shown in the picture above. Put them in a bowl covered with plastic wrap until they are cool enough to handle. Run them under water and gently loosen the blackened skin. Most of it will just wash away. Cut a T slit the length of the peppers to remove the seeds. Stuff, and I mean generously ‘stuff’ your peppers full of the onion/corn/cheese mixture. Then make a well in the center of each and add an egg. Got a little extra shredded cheese (of course you do), sprinkle it over the entire dish. Bake at 375 degrees for 25-30 minutes until egg whites are set. Allow to cool for 5-10 minutes before adding sliced avocado, fine diced red onion and cilantro to finish. This is a dream recipe, albeit a day-dream recipe. I think taking the dogs out on any morning I served Savory Egg Stuffed Poblano Peppers would be considered a fair trade. Prepare enchilada sauce. Combine with white beans and mild green chiles. Pour into a baking dish. 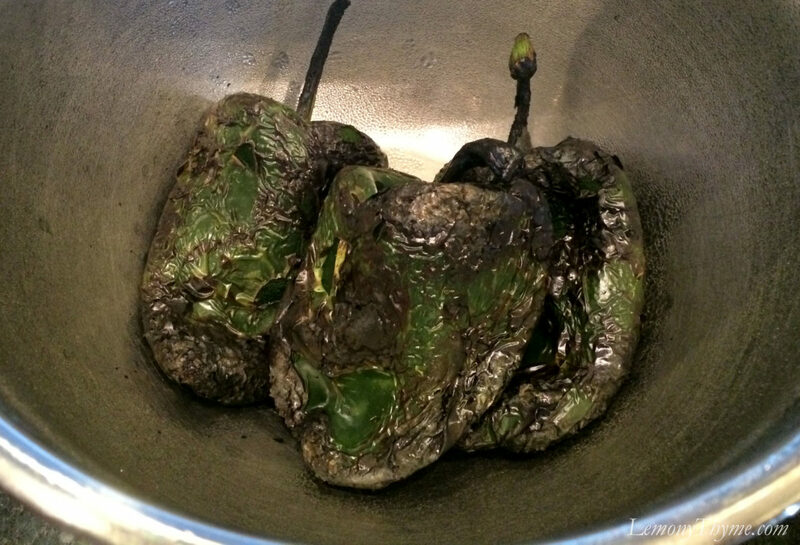 Flame roast poblano peppers (see Recipe Note in Post). In a large skillet, heat olive oil over medium heat. Sauté corn, onion and jalapeno until tender. Season with salt & pepper to taste. Remove from heat. Stir in cilantro, cream cheese and shredded cheese until well combined. Season with salt & pepper to taste. Allow to cool slightly. Remove seeds from peppers. Stuff generously with corn/onion/cheese mixture. Nestle into baking dish. Make a well in the center of each pepper. Add egg. Sprinkle with shredded cheese. Bake at 375 for 25-30 minutes until egg whites are set. Allow to rest 10 minutes. Serve with sliced avocado, fine diced red onion and fresh cilantro leaves. Love this. 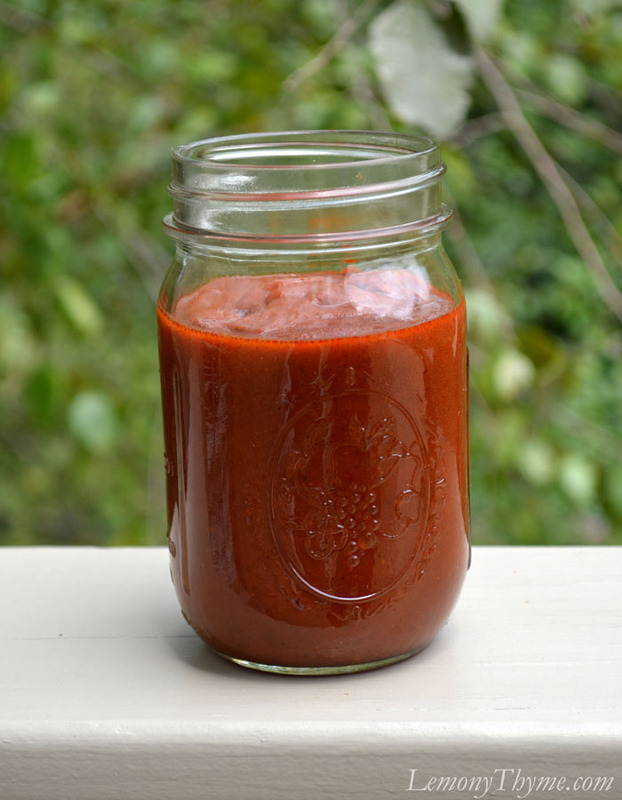 What’s your recipe for enchilada sauce?